BackgroundDRb service started, but MiddleMan.all_worker_info is empty. Thank you very much for your quickly response, I installed the debian system 1 year ago, the ruby might be installed by manually. Gem also using tar.gz. 主题: Re: 答复: backgroundrb service can started, but MiddleMan.all_worker_info is empty. to create problem for folks. > 1. Add “require ‘rubygems’” to /var/lib/gems/1.8/gems/packet-0.1. 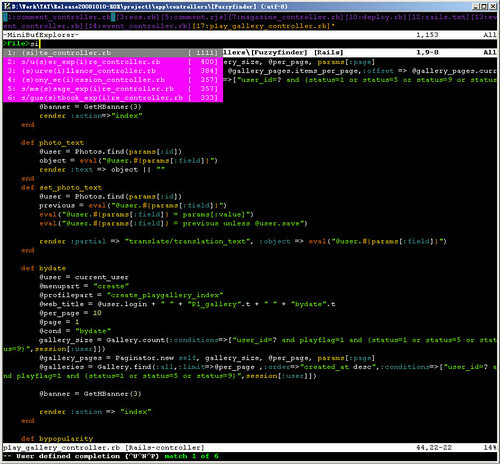 vim for ror, originally uploaded by caiwangqin.